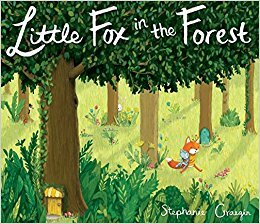 A brief survey of the end papers confirms Stephanie Graegin’s Little House in the Forest as something unique. On the spine of each book on a single shelf shared with a bevy of stuffed animals are titles that reveal the myriad narrative and pictorial structure of the book, which will include a woodland mystery, mythological creatures and a magical unicorn, a preponderance of flowers, forest creatures, a study of bears, birds and the heavens and a primer in animal illustration, the last of which could be equally applied to the story’s central young protagonist and Ms. Graegin herself. Last year’s Christmas offering The Lost Gift is an underrated gem that received a review for this series, and a few year’s before that Graegin reviewed wide acclaim for the illustrations she crafted for Water in the Park by Emily Jenkins.